Editor's note: In times of market uncertainty like this, I'm often flooded with mails from concerned readers asking for 'the next step'. Very often, there isn't one. Sometimes there is absolutely nothing that you need to do. Is this one of those times? Yes, if you've already bought the right stocks. 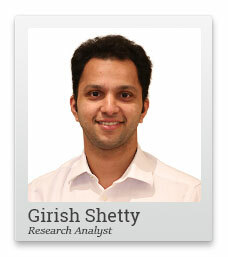 Here's an insightful price by Girish Shetty about the importance of sitting still in the face of market volatility. In the 80s, Pablo Escobar was the drug kingpin of Colombia and one of the richest man in the world. I'm thinking about him now because I've been watching 'Narcos' on Netflix - a series based on the real life story of Pablo Escobar. The series shows his rise... and subsequent fall... as one of the most notorious and feared criminals of all time - from bombing airplanes to killing civilians and cops alike, Escobar had done it all. Escobar's growing stature and influence enabled him to approach the government and strike a sweet deal. According to this deal, all his major criminal activities would be pardoned - apart from one petty crime - for which he would serve a jail term of five years. Escobar's 'jail' - was more like a resort, which he built for himself. Unable to capture him or curb his ruthless violence any other way, the government agreed to his terms. No. He couldn't stop himself, and killed some of his own men inside. He left the government of Colombia no choice but to go after him. That was the beginning of the end for Escobar. For over 16 years, the Bombay Investing Society has been guiding its members towards double, even triple digit returns. The difficulty in staying put - and constantly feeling the need to do something - is a commonly-felt human experience. We are conditioned to be busy, look busy. People associate doing nothing with being lazy. It is wired in our behavior to be doing something all the time. We encounter this in the investing world as well. When there is a correction, we feel the need to constantly monitor and do something with our portfolio - and end up making irrational decisions. That's why we see people tuned into financial news channels 24/7 - waiting for updates on the stocks they hold; watching the tickers and charts and talking heads like they're lives depend on it. Often, we tend to do the exact opposite of what we need to do. Try going to someone for advice on a stock - just to see what happens. If the person says 'Do nothing' almost every time, he might just be the right person to guide you. On the other hand, someone who is giving you the latest 'hot stock pick' every day of the week is just the guy to avoid. In StockSelect Tanushree believes in 'Do Nothing When Nothing Needs to be Done'. Recommending stocks just for the sake of it is just NOT something we do. For five consecutive months, we did 'nothing'. We sat on our hands, basically, to prevent ourselves from doing something when nothing needed to be done. We met managements, evaluated companies, studied financials, and then we asked subscribers to wait. It was important to do nothing when nothing needed to be done. News channels and brokerages were shouting 'buy' from their rooftops. Our subscribers were pelting us with letters - Can we buy now? why aren't we giving a buy when the whole world is? For good reason... Markets have promptly corrected since then. And now we see value in some good quality stocks. This year, then, we have a whole boatload of recommendations to go out and buy. Including some fantastic stocks where we had asked subscribers to wait. But, we reiterate for you here, that employing this strategy is a must - do nothing when nothing needs to be done. Or you might meet an end like Pablo Escobar in the investing world. While, BSE mid and Small cap indices have seen a healthy correction, large caps have remained almost intact during the same period. The recent weakness in the rupee versus the US dollar indicates further trouble for the market ahead. As seen from the below chart, when the Sensex corrected to its multi-year lows in March 2009, the rupee had also weakened by 21% in the past 9 months. Similarly, when Sensex hit an all-time high in January 2018, the rupee had been gradually strengthening over the past year. Post January, the rupee has been on a constant decline versus the dollar. Increase in US bond yields has made it attractive for foreign investors. This has resulted in capital outflows from the Indian market. Past history has shown that any further weakening of the rupee will adversely impact the market. But for investors, is it a matter of concern? If you have a horizon of 10 or more years, it shouldn't. As we can see from the chart, despite the rupee weakening by over 60% in the past decade, Sensex has also been up in the same period. Why should you listen to a veteran trader's exclusive views on the best strategy for the coming elections. A highly successful trader with over three decades of rich experience, is ready to share his weekly cash strategy and you can't afford to miss it. When elections come around, liquor flows like water and everyone gets drunk with power...what does this mean for liquor stocks? Read one to find out from our very own election trading analyst, Vijay Bhambwani. Equitymaster requests your view! Post a comment on "A Simple Trick to Protect Your Wealth". Click here!